Locals get set to plant to restore our lakefront habitat. 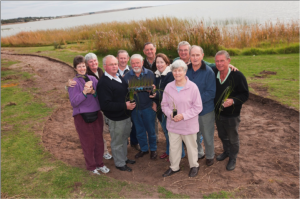 Members of the Friends of Meningie group get set to plant in July as part of the Meningie Lakefront Habitat Restoration Project. The Friends of Meningie Group and students from Meningie Area School are getting set to plant next month as part of Meningie Lakefront Habitat Restoration Project. Andrew Dawes from the Friends of Meningie Group said over 1500 plants grown by local community nurseries will be planted over two days – Friday 8 and Saturday 9 of July. “The local community, council, schools and the Ngarrindjeri are closely involved in the project and are playing an important role in restoring and maintaining the lakefront habitat,” he said. “We are excited to be closely involved in this project which will make our lakefront more attractive for the community and visitors to enjoy”. John Howard, Project Manager, Coorong, Lower Lakes and Murray Mouth Program, Department of Environment and Natural Resources said the work at the Lions Park is progressing well, with construction of a textured pathway nearly finished. “The benches are now in place and the interpretive signage will be installed within the coming weeks”, he said. If you are interested in helping with the planting, or becoming involved in the Friends of Meningie Group, please contact Andrew Dawes at the Meningie Lakes Hub on 8575 1830, email: meningie@lakeshub.com or visit the Hub at 79 Princess Highway, Meningie. The project is managed by the Department of Environment and Natural Resources and is part of the South Australian Government’s Murray Futures program funded by the Australian Government’s Water for the Future strategy. This entry was posted in LakesHub, Meningie, Revegetation. Bookmark the permalink.